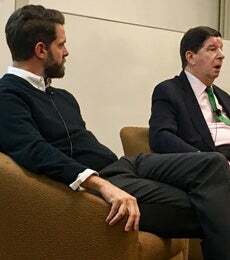 On Thursday, February 2, NYU Stern’s Master of Science in Risk Management program hosted a roundtable entitled “New U.S. Administration:Risky Spotlight on Economy, Trade and China.” Featured speakers included Michael Waugh, NYU Stern Associate Professor of Economics, and David Denoon, Professor of Politics and Economics and Director of the NYU Center on U.S.-China Relations. Using Argentina as a model, Professor Waugh illustrated how an “America First” approach to trade might cause drastic increases in the prices of everyday items in the US. Professor Denoon shared insights on the state of political offices and power in China. The session concluded with an audience Q&A. Learn more about Stern’s MS in Risk Management program here.